Garlic is well known for its many properties including its beneficial effect on the cardiovascular system, its disinfectant role on the respiratory system and its ability to facilitate traffic. With its smell, garlic is also involved in repelling flies and insects, even when sweating. 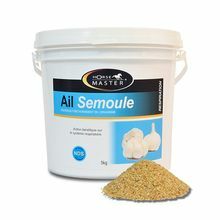 Enclosed scoop provides 10 g. Distribute to your horse in complement of the ration 2 measurements of garlic powder during 1 week per month.